Accelerate survived a heavyweight battle to win Saturday's $6 million Breeders' Cup Classic at Churchill Downs, igniting a battle for Horse of the Year honors and climaxing a day that also saw a double win on the turf for European powerhouse Juddmonte Farms and a "double double" for California owners in the sprints. Prince Khalid Abdullah's Juddmonte Farms registered two wins on the day, both with Euro star Frankie Dettori riding and including an historic victory in the $4 million Turf with two-time Arc de Triomphe winner Enable. Monomoy Girl returned to the scene of her Kentucky Oaks triumph six months earlier to win the Distaff, locking up year-end honors in her division. Several of the days' championship races turned up contenders for the $6 million Pegasus World Cup at Gulfstream Park in late January. But no success story of the day eclipsed that of owners Rockingham Ranch and David Bernsen and trainer Peter Miller, who won the Sprint and the Turf Sprint -- each time with the defending champion. That had never happened in the previous 34 runnings of the Breeders' Cup. Co-owner David Bernsen said it's been a tumultuous two years, from the highs of the Breeders' Cup wins at Del Mar last November to the lows of a December wildfire that killed dozens of horses at their training center at San Luis Rey Downs. "We win two races at Del Mar. A month later, (Rockingham Racing Manager Brian Trump) and I are in Hong Kong and Peter is dealing with a burning barn. And a week after that, we're getting an Eclipse Award," Bernsen said. Accelerate capped what might turn out to be a Horse of the Year campaign with a hard-won victory in the Classic, taking over the lead in the stretch and holding off 30-1 long shot Gunnevera by 1 length under the wire. Accelerate started from the outside, No. 14 gate and, as trainer John Sadler predicted, that gave him a chance at a clear run, outside any potential traffic trouble. On the second turn, jockey Joel Rosario got Accelerate around the leaders, three-wide, and entered a furious battle to the wire. Thunder Snow, this year's Dubai World Cup winner who refused to run at all in the 2017 Kentucky Derby, held a brief lead and salvaged third with Yoshida and Mendelssohn fourth and fifth. The outcome was decidedly international. Yoshida was bred in Japan. Thunder Snow is owned by Sheik Mohammed's Godolphin Racing and Mendelssohn came from the Irish Coolmore partners. Accelerate, a 5-year-old son of Lookin At Lucky, finished the 1 1/4 miles in 2:02.93 with Joel Rosario up. It was his sixth win from seven starts this year with five of the wins coming in Grade I races. His only loss was a second to Saturday's Breeders' Cup Dirt Mile winner City of Light. That record pits him against retired Triple Crown winner Justify in the Horse of the Year competition. 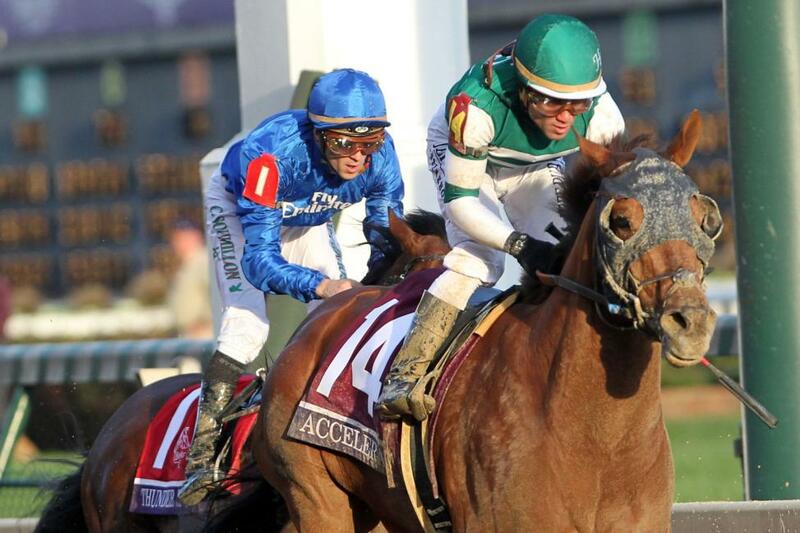 Accelerate, a Kentucky-bred, is owned by Kosta Hronis, who enjoyed his first Breeders' Cup victory and wasted no time getting to the Horse of the Year debate. "I think he's done something no one else has done," Hronis said. "I said all along he had to win the Classic to be in the conversation. He won the Classic. I heard people say maybe he did all this in the wrong year. But maybe Justify won the Triple Crown in the wrong year." Horse of the Year, Hronis said, "is about a body of work." Sadler, who also scored his first win in Breeders' Cup competition, said Accelerate has an option to run in the Pegasus and, all being well, he will contest that race before heading off to his second career at stud. Reigning Kentucky Oaks winner Monomoy Girl chased down the early leader midway around the turn in the Distaff, opened a daylight lead and held off a late bid by Wow Cat, winning by 1 length. Midnight Bisou, a familiar foe, finished third and Blue Prize was fourth. A battle between Oaks winners never materialized as 2017 Oaks winner Abel Tasman dropped from contention about the same time Monomoy Girl took over, turning in her second straight clunker. "I'm just dumbfounded," said jockey Mike Smith. "She's just not running, period." Monomoy Girl, however, was very much running, finishing the 1 1/8 miles on a fast track in 1:49.79 with Florent Geroux in the irons. The Tapizar filly would be perfect in 11 career starts but for a second-place finish, by a neck, in the Grade II Golden Rod at Churchill Downs last Nov. 25 and a disqualification from first place in her last start, the Grade I Cotillion at Parx Racing. In the Cotillion, Midnight Bisou was awarded the victory. Monomoy Girl is trained by Brad Cox and owned by a syndicate headed by Michael Dubb and Sol Kumin. Dubb said he realized after Monomoy Girl won the Grade I Coaching Club American Oaks at Saratoga during the summer, "This is one for the ages. Not just a champion, but one for the ages. "A lot of champions were crowned here today," Dubb said. "But not all of them were here in November and here in May." He said she has probably "earned a well-deserved rest" but the partnership plans to keep her in training as a 4-year-old. Kumin said they will "take a look at" running against males in the Pegasus before she gets that promised rest. Two of Europe's finest fillies, Enable and Magical, battled it out down the middle of the track in the Turf, with Enable, two-time winner of Prix de l'Arc de Triomphe, defeating Magical, winner of the Group 1 British Champion Filly & Mare Stakes just two weeks earlier, by 3/4 length. The outcome was in doubt until the final sixteenth when Frankie Dettori coaxed a bit more from Enable than Ryan Moore could find from Magical. The others were in a different race, with Sadler's Joy finishing third, 9 lengths farther back. Enable, only the eighth horse to win two Arcs, became the first to win the Arc and the Turf in the same year. John Gosden, who trains the 4-year-old Juddmonte Farms daughter of Nathaniel, admitted he was not overconfident, either before the race or in its final stages. "It was a big ask from the filly," Gosden said. "Frankie was determined to stay wide. Ryan slipped in there and I said, 'This is the filly we've got to beat.' She (Magical) was brilliant at Ascot the other day." Dettori said the soft turf was a disadvantage for Enable while, "Magical is a duck on water in these conditions." Despite her heroic second straight Arc triumph Oct. 7, Enable came to Churchill Downs relatively fresh. An injury put paid to plans for an early campaign and she made only one start before returning to France -- that in an all-weather event at Kempton. By contrast, Magical finished a close 10th in the Arc and then had another hard battle in victory on British Champions day. Enable is a fourth-generation product of Prince Khalid Abdulla's Juddmonte Farms breeding program, racing manager Teddy Grimthorpe pointed out. "Prince Khalid will have a very happy time thinking what he wants to do with this filly," Grimthorpe said of plans for Enable -- to race her at age 5 or go on to a fifth generation in the lineage. Dettori grabbed commentator Nick Luck's microphone to urge Grimthorpe, "Yes. Please say yes," to another campaign. Sistercharlie, one of five horses in the race for trainer Chad Brown, found just enough in the final yards to win the Filly & Mare Turf by a neck over British raider Wild Illusion. A Raving Beauty showed the way in the 1 3/8-miles event and held on gamely for third over Irish-based Magic Wand. Sistercharlie, a 4-year-old Irish-bred filly by Myboycharlie out of the Galileo mare Starlet's Sister, rallied from mid-pack and just prevailed at the wire over Wild Illusion, who was reluctant to load into the starting gate. Sistercharlie finished in 2:30.96 with John Velazquez up, backing up earlier victories in the Grade I Diana in New York and the Grade I Beverly D. at Arlington Park. She started her career in France, finishing second in the Group 1 Prix de Diane Longines before shipping across the Atlantic. Winning owner Peter Brant, a powerhouse owner more than 20 years ago before leaving the game, said he is "just happy to be back." As for Sistercharlie, he said, "We plan on running her next year if she's okay." Brown also trains A Raving Beauty. The last time a trainer had as many as five horses in a Breeders' Cup race, none of the D. Wayne Lukas charges managed to win the 1998 Juvenile. Expert Eye wound up at mid-stretch and delivered a big blow for the European raiders in the Mile, closing stoutly to win by 1/2 length over Catapult in the first of the two wins for Juddmonte and Dettori. Analyze It was third, a neck further in arrears, followed by Divisidero. The favorite, Oscar Performance, missed the break badly and never reached contention. Expert Eye, a Juddmonte homebred colt by Acclamation, raced near the middle of the field early, had to come wide entering the stretch and then altered course even further to the outside before Dettori was able to get him into full stride. "I wanted to jump but not get him alight," Dettori said. "But I didn't want to be that far back so I had to go to Plan B." After taking Expert Eye to the middle of the course, he said, "I could see the leaders stopping and I asked him for an extra surge. I went from despair to joy." Expert Eye ran 1 mile on good turf in 1:39.80 with Frankie Dettori in the irons for trainer Sir Michael Stoute. The win was his fifth from 10 starts but the first at the highest level. Dettori had ridden him only once before, winning the Group 3 Sky Bet City of York Aug. 25. Roy H, the defending champion, settled just off a blistering early pace in the Sprint, came wide around the leaders into the stretch and kicked away to a 3 1/4-lengths victory. Whitmore was second, 3/4 length in front of Imperial Hint with Promises Fulfilled fourth. Roy H finished the 6 furlongs in 1:08.24 with jockey Paco Lopez scoring his first Breeders' Cup win. For the owners and trainer Peter Miller, the win was a double repeat, following Stormy Liberal's defense of his crown in the Breeders' Cup Turf Sprint (see below). After winning last year's Sprint, Roy H, a 6-year-old More Than Ready gelding, finished third in the Group 1 Dubai Golden Shaheen on World Cup night, then returned to Southern California where he finished second in the Grade I Bing Crosby in July and won the Santa Anita Sprint Championship Oct. 6. "It took him a lot longer to get over Dubai," Miller said. "He wasn't the same horse in the Bing Crosby. There was nothing wrong with him. He was just stale." He said some changes in his training put Roy H back on the right course. Miller said both Roy H and Stormy Liberal "are very sound and they're easy on themselves. So as long as they're enjoying their job, we'll keep going." Shamrock Rose mounted a furious charge between rivals through the final furlong to win the Filly & Mare Sprint by a head at odds of 25-1. Chalon, who looked to have the race won at mid-stretch, held second by a neck over Anonymity and the favorite, Marley's Freedom, settled for fourth. Shamrock Rose, a 3-year-old daughter of First Dude, finished 7 furlongs on a fast track in 1:23.13 with Irad Ortiz Jr. riding, scoring her fourth straight win. Two of those came over all-weather tracks at Presque Isle Downs and Woodbine. She prepped for the Breeders' Cup with an upset win in the Grade II Raven Run at Keeneland. The filly was not nominated to the Breeders' Cup program so owner Manfred Conrad had to pay a $130,000 supplement fee to get her in the race. "It's not easy to write a check like that unless you have a lot of money," Conrad said. "But why not have some fun?" Trainer Mark Casse noted that, now she's nominated, "If she stays healthy, we could do this again next year and the year after." Stormy Liberal and World of Trouble shook loose from the rest of the field midway down the stretch in the Turf Sprint and battled to the wire. Stormy Liberal, on the outside, finally edged clear in the final strides to win by a neck. It was another 7 1/4 lengths back to Disco Partner in third. Stormy Liberal, a 6-year-old Stormy Atlantic gelding, won the Turf Sprint for the second straight year, entering this year's fray on the back of three consecutive wins in California. After last year's triumph he embarked on an international tour, finishing 11th in the Group 1 Longines Hong Kong Sprint in December, then second in the Group 1 Al Quoz Sprint in Dubai on World Cup night. Could Stormy Liberal travel again? "I think so," said trainer Miller. "You can't do this with most horses. It's his heart and durability." But while Dubai is a possibility, Miller said, "I think I've sent my last horse to Hong Kong." City of Light, never worse than third in nine previous starts, showed the way in the Dirt Mile under Javier Castellano, then drew off in the final furlong to win by 2 3/4 lengths. Seeking the Soul was second, another 2 1/2 lengths in front of Bravazo, one of the few horses who contested all three legs of this year's Triple Crown series. City of Light, a 4-year-old Quality Road colt, finished in 1:33.83. The favorite in the Dirt Mile, Catalina Cruiser, broke sharply to the outside at the start, challenged through the turn and then abruptly faded, finishing sixth. City of Light opened his 2018 campaign with a victory in the Grade I Triple Bend at Santa Anita, then won the Grade II Oaklawn Handicap in Arkansas, handing Saturday's Breeders' Cup Classic winner, Accelerate, his only loss of the year. He finished third in the Grade I Gold Cup at Santa Anita, fading at 1 1/4 miles. He then finished second in the 7-furlongs Grade I Forego at Saratoga. Winning against that company "speaks very well of City of Light," said owner William Warren. And, of the $6 million Pegasus World Cup, Warren said, "Yes." After that, he will stand at Lane's End in Lexington, Ky.